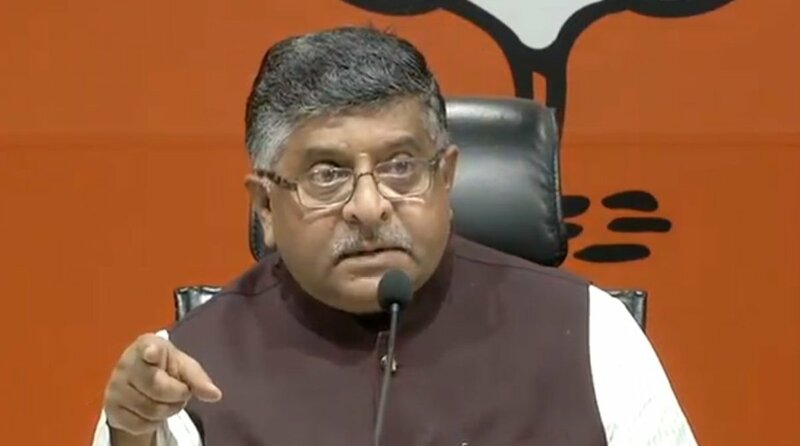 Union Law Minister Ravi Shankar Prasad accused Congress president Rahul Gandhi of playing into the hands of India’s enemies by insisting upon disclosure of the entire weapons system of the Rafale aircraft to be purchased by the IAF. “He (Gandhi) wants to help Pakistan. It’s my charge with full sense of responsibility: Rahul Gandhi is playing in hands of enemies of India by insisting upon disclosure of all weapon system,” said Prasad. Addressing a press conference at New Delhi on Saturday, Prasad slammed the 48-year-old Gandhi for calling Prime Minister Narendra Modi a “thief”. “Rahul Gandhi has called Prime Minister Narendra Modi, who is a symbol of honesty, a thief. Not once in the history of this country has any party chief addressed the PM of the country in such a manner,” said Prasad. Calling the entire Gandhi family “mother of corruption”, Prasad said that corruption has become a byword under the Modi government and “doors and windows have been closed to middlemen”. “The country should not expect anything from someone who is out on bail with his mother on charges of corruption, who is mum on the corruption by his own brother-in-law, and whose entire family took bribe in Bofors,” said Prasad. Referring to the failure of the earlier deal between UPA and Dassault, Prasad alleged that there was “pressure for extraneous considerations” on Dassault following the declaration of the company as L1 in January 2012. “When the company in question and people close to them refused to extend the same then the L1 was re-examined,” he added. The Union Minister said that despite Gandhi’s repeated demands, it is not in India’s interest to reveal the price of the deal. “It will not be desirable for me to disclose the exact details except to repeat what Finance Minister Arun Jaitley has stated – that the original cost of the fighter jet minus the weapons is 9 per cent lesser and with weapons is 20 per cent lesser than that was agreed during UPA,” said Prasad. “Does Rahul Gandhi want to know what weapons Rafale carries so that Pakistan and China get all the information? He is playing into the hands of forces inimical to the nation,” said the Law Minister. The Minister said that the Indian government is not concerned about why former French President Francois Hollande said what he said. “He is no longer the President. The current government and Dassault have clarified things,” said Prasad. Earlier today, French government and the defence maker issued statements contradicting Hollande’s claim with regard to selecting the industrial partner from India in the multi-million dollar deal. Commenting on the controversy over Reliance’s involvement in the deal, Prasad cited a February 2012 Times of India report which stated that Reliance Industries had signed a pact with Dassault Aviation for partnering in the defence and homeland security system in Asia’s third largest economy. “There is evidence that a proper MoU existed between Dassault and Reliance,” he said. He said that the 36 aircraft are urgently needed by the IAF, which is facing a severe shortage of aircraft. Prasad added that the offset clause was finalised under UPA. The Minister said that offset will help create jobs. “There are 5-6 others besides Reliance with whom offset agreement is complete and hundreds others with whom Dassault is in talks. This will create factories and jobs,” he said.